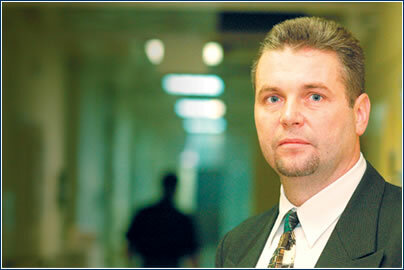 When he took up his post at the Brno Penitentiary, Luděk Kula (39) was the youngest prison director ever in the Czech Republic. He says that running a prison is just like running any firm – but the environment is a bit specific. What is a prison director’s work day like? We resolve the same problems as anywhere else – financing, investments, recruiting and dismissing employees, courses and training, and so on. I start the day by going over the night before. The nights are extremely varied. There’s a list of suicide attempts, self-inflicted harm, escape attempts, or attacks on guards. There can be various breakdowns – all it takes is a broken water pipe for the prisoners not to get lunch on time. That makes them nearly revolt. We have to resolve all situations like that immediately, so often I sit here until one in the morning. It’s not my nature to leave my team in the lurch. My people must feel that we’re all in the same boat. The chief shouldn’t stay at home, especially at critical moments. Specifically, how do you deal with stressful and critical situations? Rationally, or do you “blow up“? We’re under constant pressure, so it’s important to calmly evaluate the situation and accept it as a fact that I have to resolve rationally, without emotion. The prisoners are mostly disturbed people, and if aggressiveness, some deviation, and on top of that a conviction for a double murder coincide, you can expect anything. We have cases here when we’re almost afraid of opening a cell door. This is stressful and very dangerous. You have to be cool-headed and even a psychologist at times. How do you communicate with such people? I have a method that works. I’m not afraid of the prisoners, and I let them know it. If we have a dangerous rotter, I have myself shut in his cell with him and ask him why he’s carrying on. At first he’s puzzled that the director himself has come to him, but he finally comes to appreciate it and straighten up. None of these people have ever attacked me. Instead they say that this director’s an old hand for coming himself, without ten goons with truncheons. But the public generally sees penology in a relatively negative light. They say that the people who work there couldn’t work anywhere else. Do you think these ideas are myths? 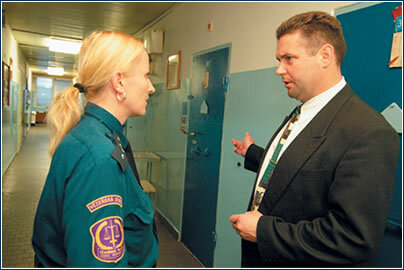 Can you tell us the most common reasons people have for becoming prison guards? I categorically reject that wash-outs and outcasts wind up with us. It’s true that when I arrived even former miners were working here, but today even the lowest-ranking employees have to have high school diplomas, and all our middle-managers have college degrees. Psychological entrance tests and ongoing education are a matter of course here. Right now far more people apply for work here than we can accept. There are many reasons. Besides the professions that are the most common here, the advantages of penal workers are also attractive, as they are covered by the same law as the Czech Republic Police. This involves severance pay, for example, and contributions for sports, etc. How do you resolve professional misbehavior? For instance, there is often talk of bribes or hazing in prisons. Are you the kind of director who solves problems decisively, or do you occasionally prefer to cast a blind eye and wait for the offender to reform by himself? I certainly don’t hesitate to decisively solve problems, but I think that all professional groups that work with people encounter corruption. We use a camera system at our prison, so it’s nearly impossible for a prisoner to bribe a guard. Still, if someone brings in alcohol or something like that for money, that constitutes reason for immediate, uncompromising dismissal. I’ve done that about ten times in ten years here. As for hazing, I think that the hazing of guards by prisoners is a far greater problem than the other way around. This is associated with the burnout syndrome. Is that a problem at your prison? Of course. But those who suffer from it don’t want to admit it. They look forward to career promotions, they wait for a new law that will guarantee them better pay, and they don’t want to abandon these goals. Sometimes there’s nothing I can do but demote them to lower positions. In order to overcome the burnout syndrome we offer our people many off-duty activities so they can blow off steam. What should the ideal boss be like? A person who has natural authority over his team and leads the firm to prosperity. But you can’t earn authority by force. I too had a hard time building mine. When at age 29 I became the director of one of the largest prisons in the country I had certain practical experience to build on, but I hadn’t the necessary overview or experience with management. I learned everything on the job and I’m still learning. I started at the lowest post at the gate and went through all the departments. I understand what bothers my subordinates, since I myself know how things work at this or that position. That’s very important for a boss. In managing my team I draw 95% from my experience, and the rest is theory. Do you think you’re a good boss? You’re asking very tough questions! (laughs) Of course I’m a bit impatient and straightforward. I make my opinions known directly. I like leading factual dialogues, and if someone convinces me that I’ve made a mistake, I’m able to recognize it and apologize. Money’s the best motivation. We have personal evaluations, career growth, and a system for rotating people in different positions. We try to protect our employees from atrophy. How do you reinforce team spirit? Our teams are very cohesive. Sometimes a team is so well bonded that I have to shift some people to different positions. (laughs) We have a well-functioning department of social and cultural needs that takes care of off-duty life. We go on excursions, to cultural events, we have a club, library, and rich sports options. I occasionally take part in such activities, but I try to sense when it’s good to leave so my employees can freely enjoy themselves. What was your worse decision? I can’t think of any principally bad decisions. I wouldn’t still be here. Sometimes even a bad order’s better than a vacuum. Here one has to act quickly and uncompromisingly, because at the end of the day I’m the only one who’s responsible for the prison. I stand by my decisions.